The International Selkirk Loop—a scenic byway through Idaho, British Columbia and Washington—attracts thousands of visitors each year. 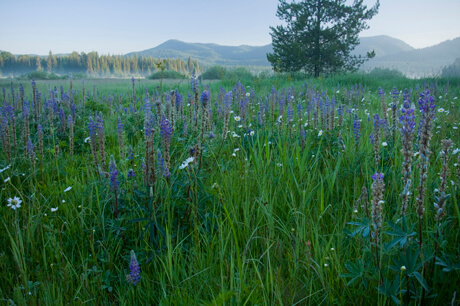 Conservation partnerships like our Bane Creek easements in the Idaho Panhandle are integral to the scenic beauty they experience. Of course, the land surrounding Bane Creek is far more than a scenic view. It provides crucial low-elevation winter habitat for moose, elk and deer while bridging the Selkirk and Purcell mountain ranges. That’s why we were eager to partner with the Johnson, Mackey and Testa families when they reached out together in an effort to conserve their adjoining properties from development. Featuring a mix of agricultural land and forest, the project was a natural fit for support from the U.S. Forest Service’s Forest Legacy Program. Now, this large habitat complex helps solidify a corridor between the Selkirk and Cabinet-Yaak ecosystems, a crucial step toward improved genetic resilience for the two regions’ grizzlies and other wide-ranging wildlife. Near the Idaho-Washington and Canadian borders, Bismark Meadows’ lowland complex of wetlands totals 1,100 acres of mixed public and private ownership. Between 2005 and 2010, Vital Ground completed four land acquisitions within this wildlife haven, netting 491 acres of lush habitat. Grizzlies, lynx, wolves and cutthroat trout are just a few of the species whose homelands include this sanctuary. On a larger scale, conservation strongholds like Bismark Meadows are crucial to grizzly recovery. That’s because the Selkirks connect the larger ranges of southwest Canada with Montana and Idaho’s Cabinet and Bitterroot Ranges. They also reach east across the roof of Washington toward the North Cascades. With enough habitat protection and community education, these borderlands can provide a key funnel, through which bears roam south from Canada before spreading west to the Cascades or east through the Cabinets to the Bitterroot wilds. It’s an ambitious vision, but biologists have tracked at least eight different grizzlies foraging at Bismark Meadows in recent years—we’d call that a good start. Ever since Vital Ground began our Right Place Campaign, we’ve had our eye on the tip of the Idaho Panhandle. 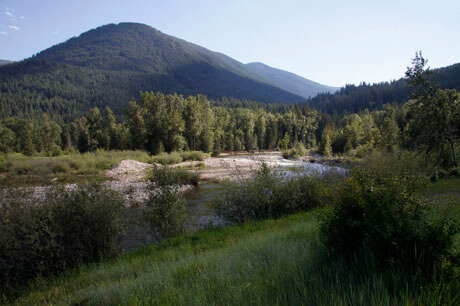 As the Kootenai River flows north toward British Columbia, its valley splits the Selkirk and Purcell mountain ranges, and just south of the border, where development has not completely encroached the valley, lies a critical biological opportunity to establish greater genetic linkage between the two ranges’ populations of grizzlies, threatened Canada lynx, and other wide-ranging wildlife. So when Sig and Anne Weiler expressed interest in permanently conserving their 43-acre property on the east edge of the Selkirks, we jumped at the opportunity. 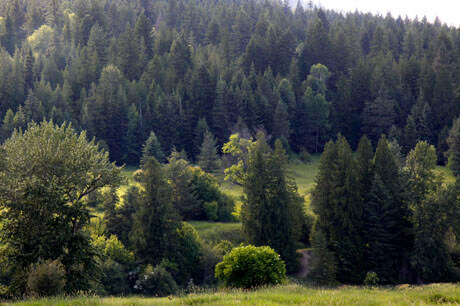 The Weiler’s generosity and commitment to conservation led to their charitable donation of the property’s title, adding another acquisition to our growing conservation footprint in the Kootenai Valley. Now we manage the land to maximize habitat value, including recent post-wildfire restoration work that will return a diverse fire-resistant timber stand after much of the property burned in the 2015 Parker Ridge Fire. One of our early projects in the Kootenai Valley of North Idaho, the Smith Creek partnership marked a landmark collaboration with Ducks Unlimited to conserve a large wetlands complex that helps bridge core habitats in the Selkirk and Purcell mountains. Thanks to a grant from the North American Wetlands Conservation Act, Vital Ground deeded 620 acres of the property to Ducks Unlimited while retaining 151 acres under our own fee title. Now this precious habitat hosts great flocks of migratory birds while also helping establish genetic linkage between ecosystems for grizzlies and other wide-ranging wildlife. Vital Ground’s purchase of the Thorman Farm gave us something like a double-whammy for wildlife. 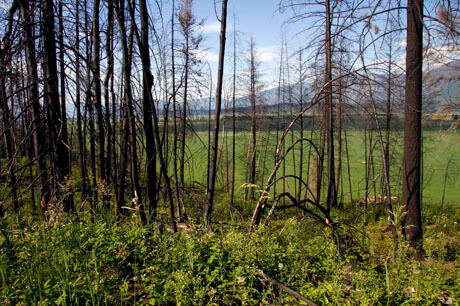 That’s because this mostly-forested property drops down from the east slopes of the Selkirk Mountains to abut the Smith Creek Wildlife Management Area, 151 acres of which Vital Ground also owns. Like our Smith Creek acquisition, the Thorman purchase relied on funding from the North American Wetland Conservation Act, with a stream on the property flowing directly into Smith Creek. All together, the projects create nearly a thousand acres of protected habitat extending from the Selkirk slopes into the Kootenai Valley, a critical step forward in establishing a robust wildlife corridor between the Selkirk and Cabinet-Yaak ecosystems. As its name suggests, Boundary Creek marks the closest thing we have to owning land in Canada. 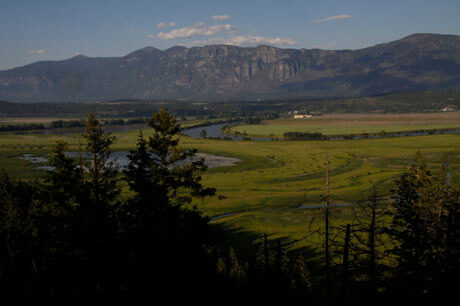 Just south of the border, this important little chunk of wetland habitat became our first and northernmost of four Kootenai Valley acquisitions within just a few miles of each other. 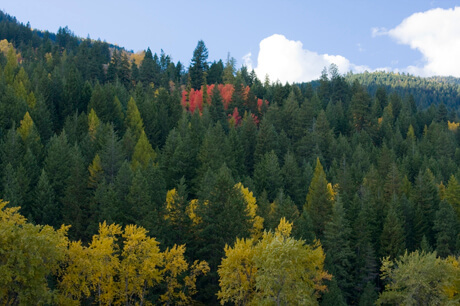 The parcel comprises a portion of the Boundary Creek Wilderness Management Area, which is overseen by the Idaho Department of Fish and Game to develop fish and wildlife habitat and provide public recreation access. Thanks to a grant from the Owens Foundation, we were glad to chip into the effort to conserve this critical habitat that helps connect the Selkirk and Cabinet-Yaak ecosystems—not to mention two countries.